Gear & Advice You Can Trust. 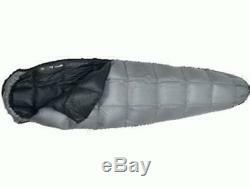 Sea To Summit Micro 2 MCII Compact Down Sleeping Bag - Regular - LH Zip. NEW ULTRA DRY DOWN MODEL! The Micro McII is the smallest lightest sleeping bag we offer, it is an amazingly warm bag for such a small size. The Micro series are our lightest weight bags, fully-featured and filled with 850+ Loft Eastern European Goose Down with WATERPROOFUltra Dry Down. These bags incorporate our 2D NanoShell providing the lightest most breathable water resistant shell. With every Sea To Summit bag includes a "Down Batch Test Report" analysis certificate from the International Down Feather Laboratory (IDEL) to certify the superior loft of the down used in our Sea to Summit sleeping bags. You can be sure of the quality and fill within each bag. Designed with a contoured mummy shape, the Micro series is the lightest and most compact sleeping bag in its class. With a unique drawcord opening at the foot for effective temperature regulation, the Micro series can be converted from an open duvet to a technical box foot mummy sleeping bag. Focused on achieving ultra lightweight performance, this bag uses a YKK #3 zipper with micro anti-snag and quilted baffle construction to optimise down placement; resulting in the best warmth to weight ratio fully-featured sleeping bag. Form fitting, the Micro series uses a 55/45 fill ratio to insulate your core as the bag rotates with you throughout the night. A security pocket located inside the bag is easily accessible, ideal for stowing electronics to preserve battery performance in cold conditions. The soft touch lining fabric is down proof by construction and highly breathable offering a comfortable sleep. The quilted baffle construction provides consistent down density throughout the sleeping bag ensuring the down is where you need it most. 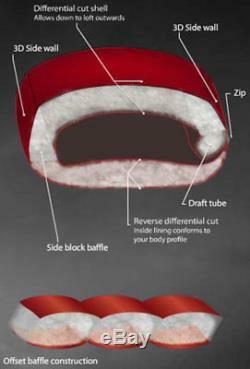 Traditionally quilted sleeping bags relied on sewn through construction resulting in cold spots across the seams. Quilted baffle construction eliminates these cold spots, using lightweight 3 dimensional baffles to secure the down across both X and Y axis. Repels moisture Retains loft Dries faster Anti-bacterial and anti-microbial Prolongs the life of your sleeping bag. In a world of technical brilliance it is remarkable that the performance of certain natural products have not been surpassed. Despite advances in modern fibre technology, down is still the best insulator warmth for weight, and is also the most durable sleeping bag insulation. The problem with down is its vulnerability to water; moisture decreases the ability of the down to loft to its full potential and insulate, decreasing the warmth of your sleeping bag. Once down is damp or wet, it also takes a long time for it to dry out and effectively insulate again. With the introduction of water-repellent ULTRA-DRY Down we have virtually eliminated the negative effects that moisture has on down. The ULTRA-DRY Down water-repellent treatment protects the down from external moisture and internal condensation. ULTRA-DRY Down is a permanent Nano-level water repellent polymer treatment applied to our high loft, high quality down. The Nano-thin treatment vastly improves our down s reaction to water without effecting its weight or loft performance. ULTRA-DRY Down retains over 60% more loft and absorbs 30% less moisture when compared with untreated down. Sea to Summit sleeping bags dry out 60% faster than bags with untreated down. The Nano-level treatment also inhibits bacterial and microbial growth, which makes Sea to Summit sleeping bags more hygienic and improves their lifespan. Sea to Summit sleeping bags, using ULTRA-DRY Down in combination with our already formidable 2D- and 3D-NanoShell system give you the best chance of sleeping warm and dry, day in day out throughout the worst of conditions. With these technologies combined there is simply no reason to choose any other insulation or shell for your sleeping bag. No loss of treatment effect has been seen in over 14 wash cycles. Loft Loft is the volume for a given weight of down. It is used to describe the quality of down, relating directly to the insulating performance. High loft down is warmer for a given weight than low loft down. Higher lofting down will fill a larger volume of space for a given weight. As a result, less down weight is required to fill each baffle in a sleeping bag. This translates to a lighter sleeping bag. The most common measure of loft is called Fill Power. 850 Fill Power implies that one ounce of this down will loft to fill a volume of 850in3. 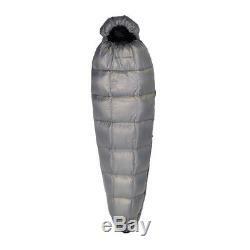 850+ Loft Goose Down 850+ Fill Power (Loft) Goose Down is the very best quality down available for sleeping bags. It provides the highest insulation for its weight and will last the longest. Sea to Summit 850+ Loft series bags are all filled with Eastern European Mother Goose 850+ loft down. Eastern European Goose Down is well renowned for its high quality, achieving the best loft, with the largest clusters that are strong and resilient, lasting for years. 650+ and 750+ Loft Premium Down. We guarantee our sleeping bags are filled with premium down that exceeds the stated Fill Power in accordance to the International Down Feather Bureau (IDFB) standard. EN13537 is a European standard for sleeping bag temperature ratings. Everyone sleeps differently; some people are very warm sleepers while others feel the cold easily. There are many factors that affect your warmth and comfort in a sleeping bag. An important factor is that you use a good insulating mat, so your body heat isn t drawn into the cold ground you are sleeping on. Other factors include your tent or shelter, gender and metabolism, clothing, sleeping bag liner, use of the hood and your daily calorie intake. Although the EN13537 standard does not identify a single precise temperature a tested sleeping bag is suitable for, it does provide an industry standardised temperature range that a typical user can refer to as a guide for the conditions their bag will be most comfortable in. The EN13537 standard provides three temperature levels to guide a consumer in their choice. The temperature at which a standard woman can expect to sleep comfortably in a relaxed position. The temperature at which a standard man can sleep for eight hours in a curled position without waking. Box quilted mummy convertible, 2D NanoShell , differential cut shell, box quilted baffles, 55/45 fill ratio, anti-snag along side zip, hood drawcord with dual adjustment, YKK #3 side zip, drawcord foot closure, large sized internal zip pocket, includes lightweight Ultra-Sil compression bag, mesh storage cell and laundry bag. 850+ Loft 95% European Goose Down ULTRA DRY DOWN. Ultra lightweight trekking, Travel, Hiking, Camping, Cycle touring, Alpine style climbing. XSmall - 6L to 2L. Size: regular up to 183cm tall, chest circumference 146cm, hip 128cm and foot 88cm. 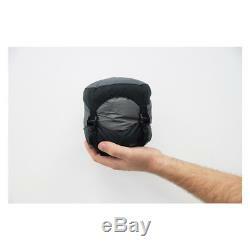 Compression bag and packed size: Small 24 x 15cm. There are plenty of discount operators out there, but all you get from them is a cheap price and nothing else. If it's just a price you're after these guys might be for you, but if you're after a service orientated company that won't sell any other way then welcome to our store. Our cheap postal prices are live up to date prices with Australian post or courier. Our website is state of the art safe and secure, using a 128 bit SSL encryption protocol, the most secure online-shopping protocol. Unfortunately we DO NOT accept EFT direct deposit. If your item is a double swag or over 20kg parcel must be sent via courier and a daytime street address is required - NOT A PO BOX. Express and regular options are available for most items. All item prices include GST. All payments made payable direct to'Wild Earth. While all care is taken, any errors or omissions/variations in the item details are unintentional. Colours and images are for illustrative purposes and can vary so please specify when ordering if you require a specific colour otherwise an alternative colour may be sent depending on stock availability. WILD EARTH AUSTRALIA PTY LTD reserves the right to make changes to this site and these terms and conditions at any time. From time to time we may contact you about offers and new products. You can easily be removed by unsubscribing. For full terms and conditions please visit here. We are here to help you! The item "Sea To Summit Micro 2 MCII Compact Down Sleeping Bag Regular LH Zip" is in sale since Tuesday, April 4, 2017. This item is in the category "Sporting Goods\Camping, Hiking\Outdoor Sleeping Gear\Sleeping Mats". The seller is "wildearth-australia" and is located in Gold Coast.